The walk starts outside the Galleria in Hatfield and heads south along the route of the old railway branch-line from Hatfield to St Albans. 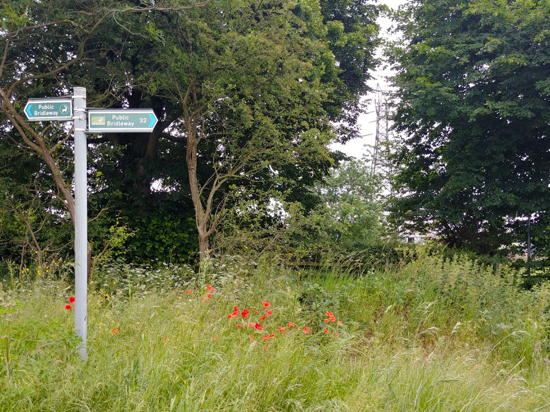 You will pass the restored station of Nast Hyde Halt, walk for almost two miles down a tree-lined byway, cross Colney Heath common, then climb the hill over to North Mymms across Potwell Valley with its meadows and swallow holes. Eventually you drop down to Water End and cross the swallow holes. 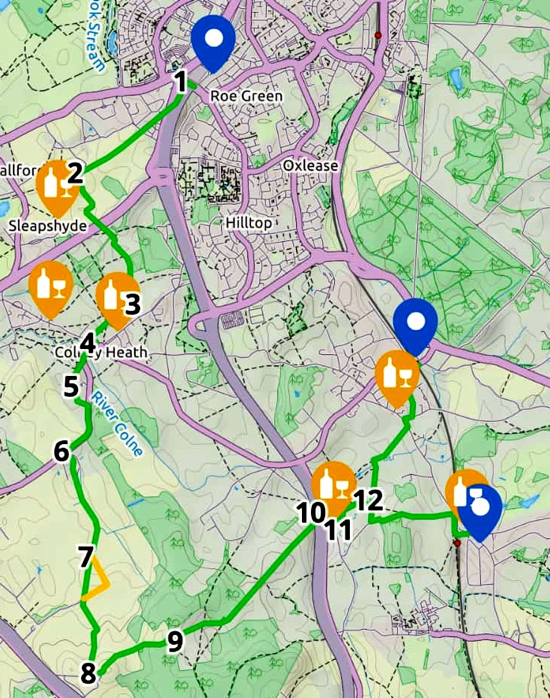 At that point the route splits for those returning to Brookmans Park and Welham Green. Catch the 610 Uno bus from Brookmans Park or Welham Green to the Galleria in Hatfield. As you approach the Galleria the bus swings left down College Lane and then takes another 10 minutes going round the University of Hertfordshire before returning and arriving at the Galleria bus stop. 1: Head west from the bus stop looking out for a sign on your left immediately after you cross the A1(M). 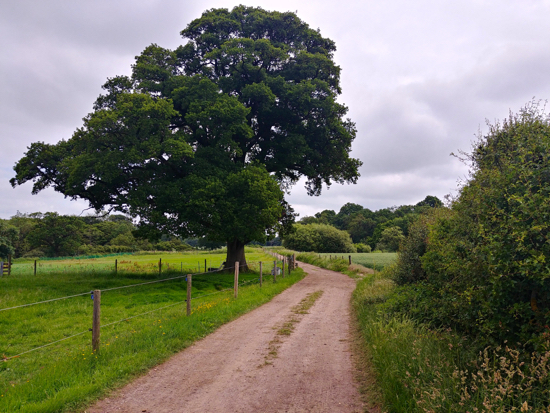 This is the Alban Way, part of the National Cycle Network Route 61, and leads down to the route of the old railway track. Take this path and head south with the A1(M) on your left. The route then turns to your right under a road bridge. Follow the path south-west as it goes through a small housing estate and then crosses Ellenbrook Lane. Cross the lane and continue heading south-west. 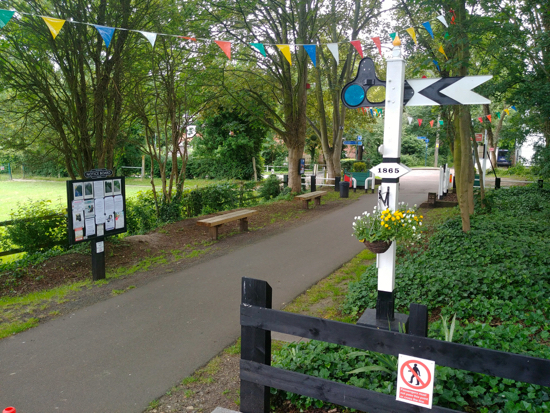 Immediately after Ellenbrook Lane you will pass through the restored Nast Hyde Halt, one of the stations on the old St Albans to Hatfield line. It's worth stopping here to explore the community effort that has preserved some of this railway history. The video below, shot by North Mymms resident and photographer, Ron Kingdon in 1968, shows this line when it was operating. And a more recent video, shot in 2017 by Rediscovering Lost Railways. Continue walking south-west following the track until you see a footpath on your left. This is marked Byway Open to All Traffic 51. 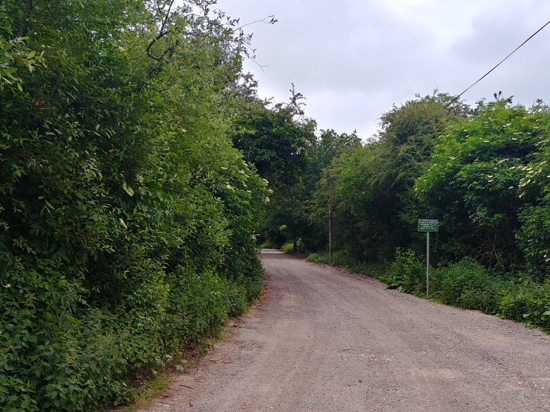 2: Turn left and follow this wonderful byway as it weaves its way south, crosses the A414 North Orbital Road, and continues until it becomes a gravel road at the point where a large concrete cube blocks the byway. 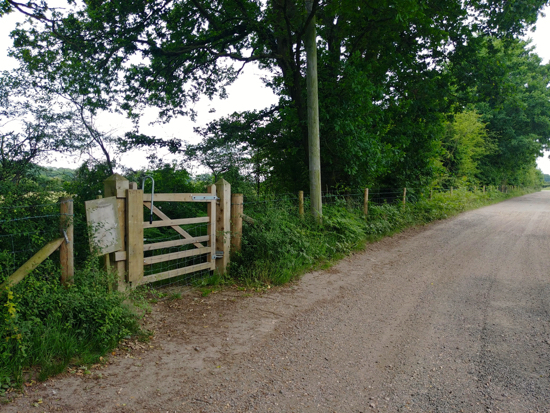 Continue along this road until you reach a footpath intersection just before a new estate of houses. If you reach the houses you have gone too far. 3: At this intersection take the path that goes off to your right and then bends to your left heading south-west behind the backs of the houses. Continue with the houses on your left and the field on your right. 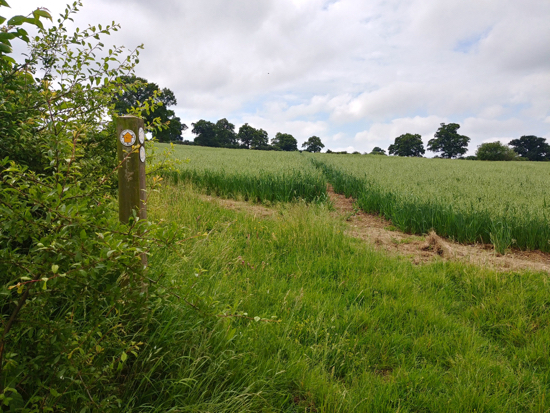 Follow this path over a number of fields, still heading south-west, until you reach Colney Heath High Street. 4: Cross the road and turn left. Soon after the shops turn right to reach the common. You will see a coal post in front of you. Head south-west a short distance then climb the path to reach Coursers Road. Here you turn right, cross the bridge, and take the gravel track on your right. Continue down this track until you reach a wooden gate on your left leading to another part of Colney Heath Common. 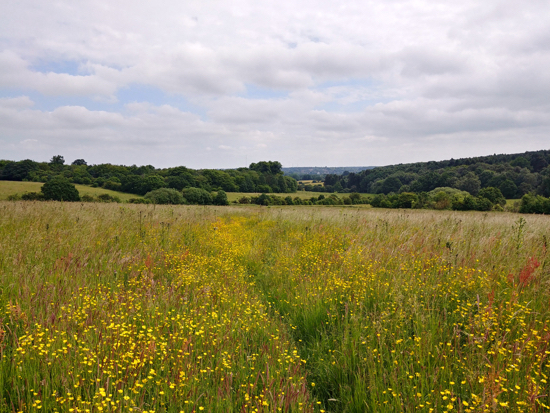 5: Take this path and head south, diagonally across the field. You will come to a gap in the hedgerow and your way is south-east to your left with the hedgerow on your left and the field on your right. You are aiming for the wooden gate in the far corner of the field. 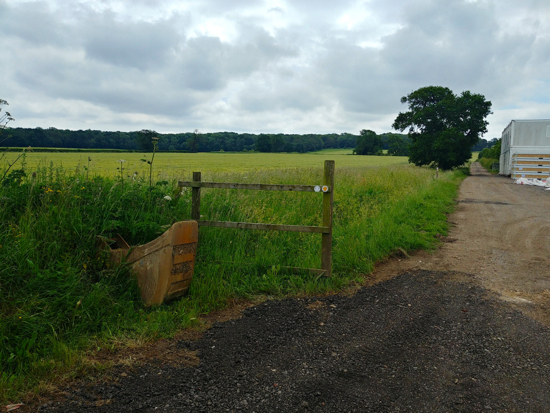 Go through the gate and turn right heading south with Coursers Road on your left and the field on your right. The path bends round following Coursers Road and you continue, now walking south-west, until you reach a path on your left which crosses Coursers Road and enters Coursers Farm. 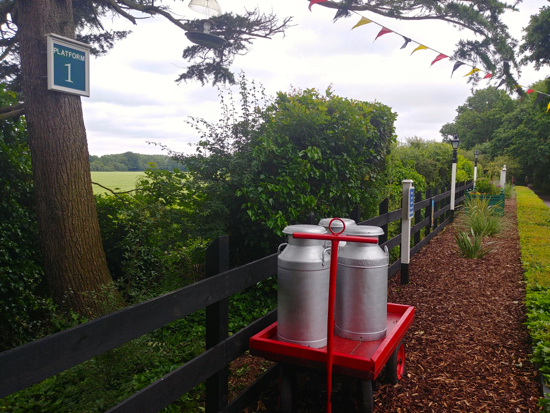 6: Follow the white markers with yellow arrows through the farm until you leave the farm buildings behind and have a track ahead of you. On your right will be an industrial site with machinery. You continue straight heading south. 7: When you reach a group of portable buildings and containers you turn left and then have two options. 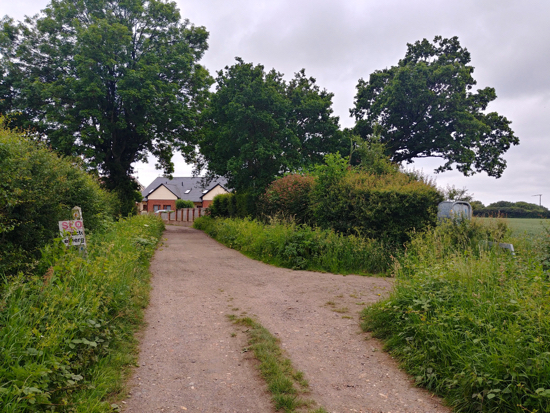 You could follow the white signs with yellow arrows as the path weaves through the buildings and heads south-west through a narrow path overgrown with trees. But this is difficult to walk, especially after rain. 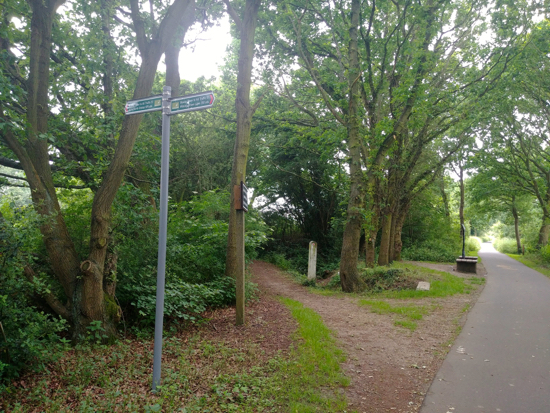 Instead, you could follow the white sign which is marked 'permissive path' (see yellow detour on the map above) and follow this round to meet the path. Whatever way you choose you will reach a junction where the two routes meet. Your way is to continue heading south-east on the footpath (it's footpath 8) crossing several fields. There are way-marked post set up to guide you. At one point, close to the top of the hill, you take a right turn followed by a left turn and then continue through the crops. 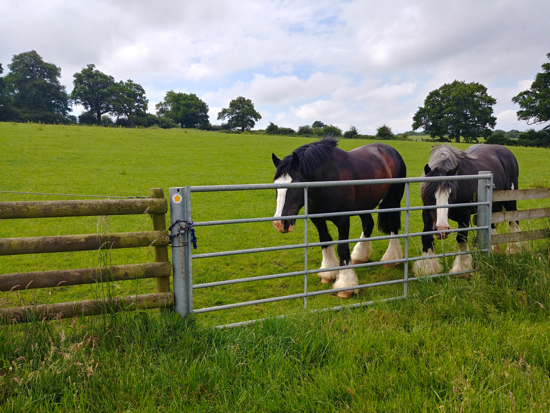 You will pass through a field that had grazing shire horses the day we did this. They were friendly. 8: When you reach the buildings at top of the hill, turn left and follow the track north-east. 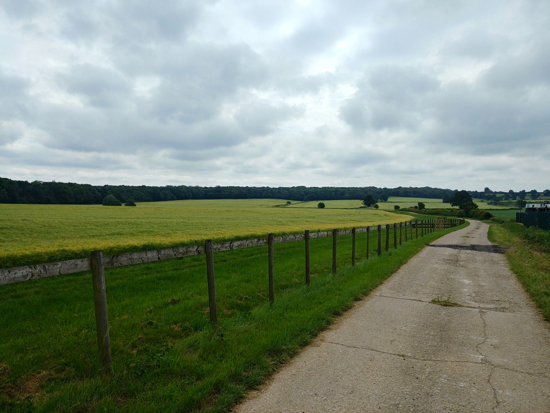 At this point there are some wonderful views over the Hertfordshire countryside to the north-west and west. You can see St Albans cathedral on a good day. Continue north-east. On your right is Redwell Wood. 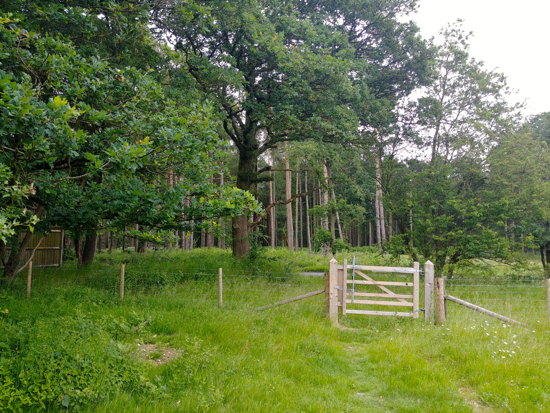 9: Follow the path through the woods until you reach a gate opening out a great view to the north-east over North Mymms. This is Potwells Valley. 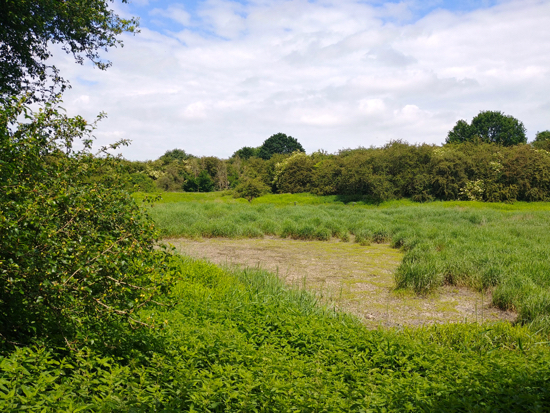 There is an interesting feature about the geology of this area on the North Mymms History Project in a feature entitled The Natural History Around Water End. Follow the path north-east as it drops down the hill. Cross a track, and then continue heading straight north-east to a small wooden footbridge. Cross the footbridge and then climb though the field to a wooden gate leading to a path running north-east alongside Cangsley Grove. Turn right on this path and continue through the woods. You will cross another track, and continue north-east until you reach a path running along the west side of the the A1(M). Here you turn left and head north until you reach Tollgate Road. Turn right on Tollgate Road and head north walking under the footbridge. 10: Just after the footbridge take the path on your left as it climbs left and over the footbridge crossing the A1(M). Drop down to the other side where the path emerges on Swanland Road. Cross Swanland Road and walk south-east down Warrengate Road until you reach The Woodman Inn. 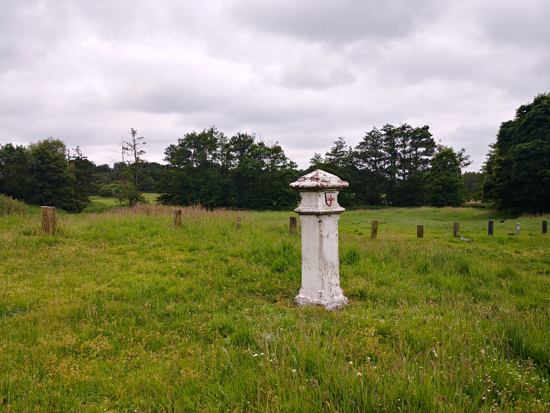 11: Here you turn left on the footpath immediately after The Woodman Inn and follow it round over the swallow holes climbing through the woods at the other side to reach an open field. 12: At the open field the route splits for those heading back to Brookmans Park and Welham Green. 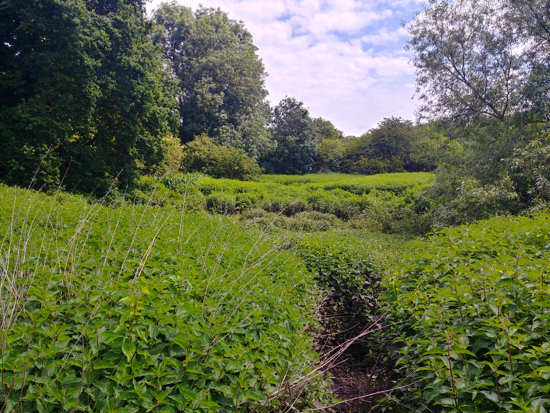 * Those heading to Brookmans park turn right, follow the path round to the right with the field on your left and the hedgerow on your right. 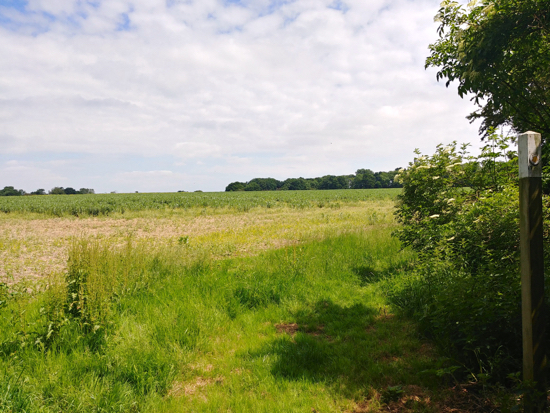 Head for the south-west corner of this field and cut through the hedgerow to reach Bradmore Lane. Here you turn left and follow the lane to Station Road where you turn right, cross the railway bridge and return to Brookmans Park. 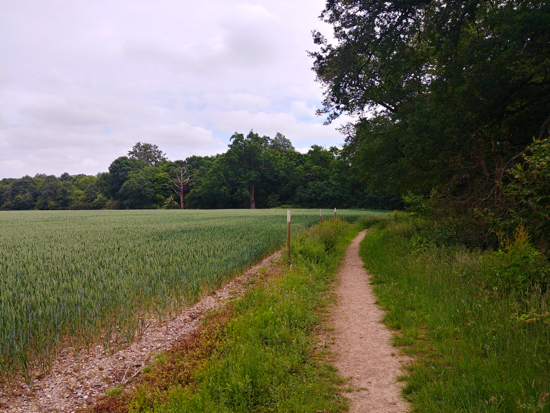 ** Those heading to Welham Green turn left and follow the path as it heads north-east with the fields on your right and the hedgerow on your left. 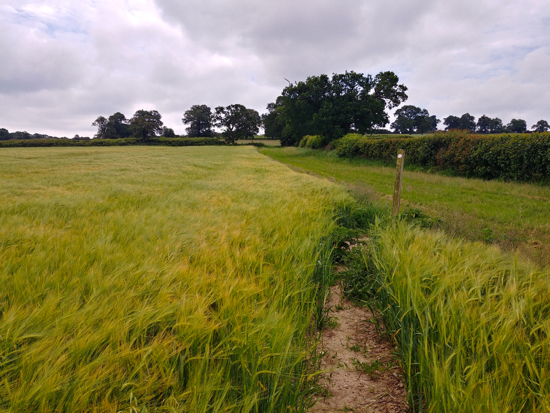 The path will go through a gap in the hedge before bending right and then continuing north-east across a field to reach Station Road. Turn left on Station Road, then right on Bulls Lane, left on Holloways Lane, and then turn right on Dixons Hill Road to reach the railway station.